From solving relationship problems to figuring out how to afford that second glass of wine, a financial adviser can be as helpful as a therapist. 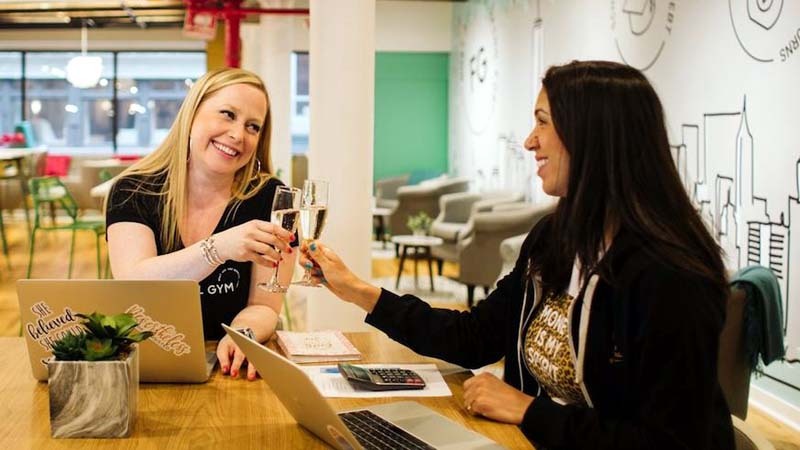 Financial Gym founder Shannon McLay (left) wants you to feel good having that drink, instead of worrying about how much it cost. Most of us don’t think we need a financial planner. Maybe you’re one of the lucky ones who can pay their bills and throw a few dollars toward their 401K every month. Or maybe you live paycheck to paycheck and all you do is worry about money. Thing is, there are things both of these people can learn from a money manager. April is Financial Literacy Month (not to mention Tax Day on the 17th), and it’s time to consider how a financial planner could change your life — because the work a real financial manager does is nothing short of that. So, who needs a financial trainer? We asked McLay what unlikely candidates may get out of making a few money moves. The Financial Gym’s clients range from 18 to 72 years old. Young people just entering college come to her as a preemptive strike against student loan debt, a problem that 44 million Americans are facing to the tune of over $1.4 trillion. “I have a conspiracy theory that the schools don’t want you to know these things, because how else would they get you to take out six figures of debt, which makes no sense?” she says. One of her clients came in with $250,000 in student loan debt at the age of 26, telling McLay, “I feel like I’m unlovable, like no one would marry me with this debt. And that’s such a sad thing, but we’ve heard that more than once.” Being fiscally responsible doesn’t just assure your financial future — it may be something to put on your Tinder profile. If a financial problem is bad enough, they’ll figure out a way to find you, right? That’s the kind of thinking that gets you into real trouble — one of McLay’s clients found out from her boss that her wages were going to be garnished because she hadn’t responded to repeated collection requests. “We have people literally come in and open mail with us,” says McLay. So if you just can’t take the pressure of knowing how big your problem is, let someone else sort through the mess and figure out a way through. It’s not on McLay’s business card but it should be: In the four years that Financial Gym has been in existence, not one of the couples have divorced. That’s because financial advice often ends up being relationship advice. McLay noticed a wife spending $1,000 over three months in $3 increments at Rite Aid. It turned out she was buying Diet Cokes there because her husband didn’t like her buying it in bulk at the grocery store because it’s unhealthy. “I say, OK, but what’s really unhealthy is your wife acting out because she’s not allowed to have it in the house,” she says. Want to feel like you’re working as a team and being honest with each other? Nobody can hide behind a balance sheet. Even clients who are doing well come to McLay worried — nobody, she says, feels “abundance” when it comes to their bank account. “One of my most financially set couples, I say what’s your goal and he said, ‘I just want to know I can afford an extra glass of wine,’” she recalls. “They had $90,000 in the bank. Our really fit clients are scared to spend money or judge themselves for spending money.” Talking to a financial advisor can help you understand how to spend money, not just save it.